John Collins was featured in the Spring 2014 issue of OfficeMax's on-line magazine, WORKPLACE EXCHANGE, in an article entitled Portraits of Success. Read the story here! Collins Healthcare Education, Inc. was established in 1995 and has been offering educational programs to activity professionals and national and state associations for over 15 years. The main focus is to provide quality education for activity professionals in meeting the recreational component of each client being served in the senior healthcare industry including adult day care centers, independent retirement communities, assisted living facilities, skilled nursing facilities, hospital-based long term care units and specialized memory care units. Collins Healthcare Education provides corporate and private educational programming and services through out the state of Florida and nationally to meet the ever changing needs of activity professionals. These companies include HCR/Manor Care, Sea Crest, Senior Health Management, Consulate Health Care, Harbor Chase, Emeritus, Beverly Enterprises, Life Care Center of America and many others. John Collins, president and owner, is a Certified Therapeutic Recreation Specialist (CTRS), Activity Consultant Certified (ACC) with a specialization in Education (EDU) and an Activity Consultant – Board Certified (AC-BC). He graduated from the University of Florida in 1989 with a bachelor’s degree in Public and Therapeutic Recreation. John Collins is an active member of the Florida Health Care Activity Coordinators Association (FHCACA) where he has served as State Education Chairperson, Region Representative and held many offices in his local district. He has received the Annalea Blair Educational Scholarship, Member of the Year Award, Best Newsletter and Best Scrapbook Awards. John has also served as a member of the Board of Directors for the National Certification Council for Activity Professionals (NCCAP) for six years where he held the office of Vice President and Treasurer. John received the Modular Education Program for Activity Professionals (MEPAP) Instructor of the Year Award from NCCAP in 2011. He received the Distinguished Service Award from FHCACA in 2010. 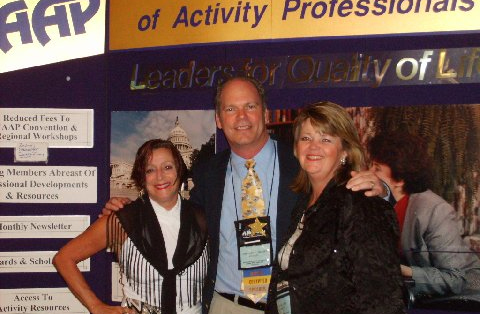 John has been a member of the National Association of Activity Professionals (NAAP) and has presented at several national conferences.